Skin Cancer is the most common form of cancer in the United States. Ultraviolet (UV) rays from the sun are the leading cause of skin cancer. July is UV Awareness Month. During this month make sure to take action to prevent skin cancer and reduce the risk of UV damage. Summertime means spending more time outside enjoying the nice hot air. Make sure to check the local UV index before spendin g time at the pool, going to the park, or even enjoying a walk with your Pokemon Go. 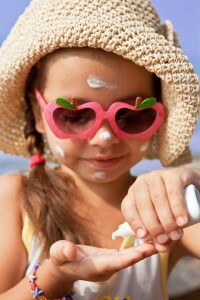 Check your sunscreen to make sure the Sun Protection Factor (SPF) is between 30 and 50; no one wants burnt skin. Always apply sunscreen lotion 15 minutes before going outside. You will need to reapply your sunscreen every two hours. You should avoid sitting in direct sunlight between the hours of 10:00 am and 4:00 pm. You need to wear sunscreen throughout the year, and you need to apply sunscreen more often if you are swimming or sweating. Some sunscreen lotions are waterproof, but you should still apply more sunscreen whenever you get out of the pool. For summer tips with your home’s plumbing, call Heidler, Inc. in Annapolis, MD at (410) 268-7191. A friendly customer service representative can assist you.